I use a little data backup service called Mozy. You should use it too. “Why?“, you ask. Because bad things happen and data goes bye-bye. Tears flow. Much grief ensues. “Oh… but I backup my stuff to an external USB drive! I copy all of my pictures and stuff to some DVDs and store them in my sock drawer! !” Ever hear of thieves? Ever hear of a house fire? 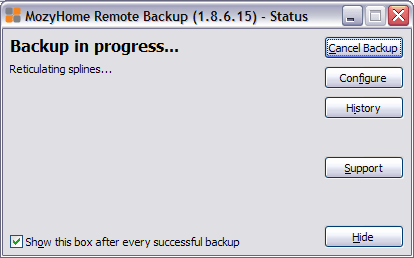 Suddenly that “backup to my external USB drive” doesn’t look so awesome. Enter Mozy. For $4.99/month, you have “unlimited storage” with Mozy online — away from burglurs, house fires, and all that jazz. “But what about ‘online thievery’? This Intar-web I’ve heard about is a dangerous place!” Then feel free to encrypt your data with your own PGP encryption key. Sign up for the $4.99/month Mozy service. Install the Mozy application on your home PC (or Mac). Select the folders you’d like to backup — pictures, documents, music (if you like), money software files, and so on. Depending upon how much data you have to backup, the initial backup can take a very long time. This is to be expected. You can stop that backup at any time, of course, but if you have several gigs of data to backup, then it’s going to take awhile to push that data online. After the initial full backup, though, you are only ever backing up changed or new files, so subsequential backups are pretty quick. Deleted files remain on the backup for 30 days, so you can get them back. Nice! Stop dilly-dallying and just do it. Trust me on this. I’ve noticed the message “Reticulating splines…” for awhile now, but never thought much of it. Evidently there is a bigger story behind that particular message: something to do with SimCity, and other wackiness. Oh, Mozy — you so crazy!